Many people ask “what is raw silk?” There a are few basic differences between raw silk and traditional silk. The primary difference is that raw silk is silk containing a gummy substance called sericin. Some of the sericin is removed by boiling the silk in soap and water. Raw silk has a nubby and rougher surface than traditional silk. The fiber used to make raw silk is shorter than traditional silk and this also contributes to its unique texture. When you imagine silk, you probably in vision a refined and shiny fabric. In addition to a different texture, raw silk is also lighter weight than silk. These two images illustrate the different looks of raw silk and traditional silk. 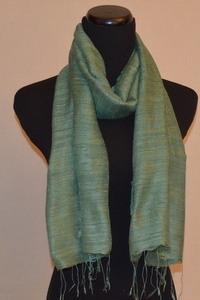 As you can see the jade green raw silk scarf has a nubbier texture with a mat finish. 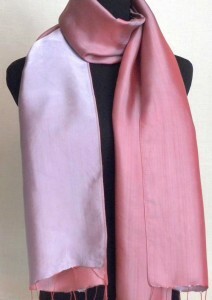 The dusty rose silk scarf is shinier and is heavier. The light weight of raw silk makes it ideal for summer and spring wear and warmer climates. In its natural state, raw silk’s color ranges from light beige to yellow. When dying raw silk, it is very difficult to perfectly match the color samples, but this contributes to the uniqueness of the fabric. Each individual raw silk scarf will have slight differences.